Customer Bay Welding has finished a new custom 44 x 14 gill-netter, the Highlander, a Cook Inlet Stern Picker/Longliner combo vessel that was designed for high speed and comfort while fishing. 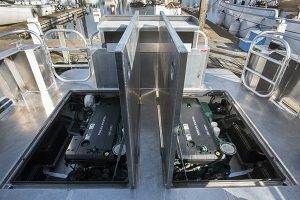 And thanks to twin Volvo Penta D11 625 hp engines from Pacific Power Group’s Marine team and dealer In-Demand Marine, the Highlander is a unique, powerful, and fuel-efficient project made possible. 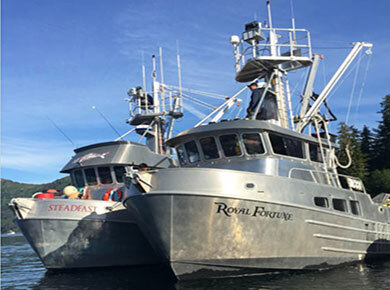 The primary goal of the project was to design and build a boat for owner Ken that could get to the fishing grounds at 25 – 30 mph and get back to port with 5,000 – 10,000 pounds of fish on board at 20 – 25 mph. The overall comfort of the crew and practical usability of the boat were high priorities as well. What resulted is a one-of-a-kind fishing boat that is fast, extremely maneuverable, and well-appointed with technology and comforts. The Highlander’s D11 diesel engines are EPA Tier 3 rated, which give the fishing vessel environmentally-friendly performance. The fuel economy, when full of fuel and water, averaged .72 nautical miles per gallon from 14 to 32 mph, showing a great efficiency range across a wide speed selection. The boat hull, structural calculations, and stability engineering were performed by Coastwise Corporation in Anchorage, Alaska. The cabin design, systems layout, and detail design were completed in-house by Bay Welding. 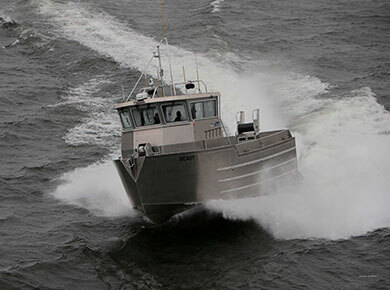 The hull concept design was a spin-off of Bay Welding’s successful high speed 42 x 14 hull that was also designed by Coastwise and Bay Weld, which was built a few years ago for the Alaska State Troopers. 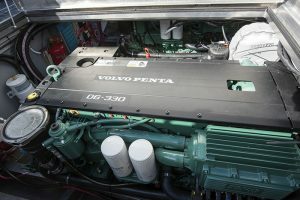 Even though there can be only one Highlander, Pacific Power Group can design a custom Volvo Penta power system for your boat. Contact us for more information or to get started. Volvo Penta engines and generators have been trusted for more than 100 years to provide quality and environmentally friendly propulsion for marine vessels. Volvo Penta’s diesel engines are trusted in commercial and leisure applications alike for their excellent power-to-weight ratio, low fuel consumption and legendary reliability. Volvo Penta marine engines are designed to keep running with maximum uptime, the highest levels of safety and minimal environmental footprint. The aluminum 36’, 12-passenger Sorceress will take Puffin’s guests out on Resurrection Bay and the waters near Seward, Alaska for world-class salmon, halibut, rockfish and cod fishing. With such expansive territory to cover on their trips, the Sorceress depends on its twin Volvo Penta D6-330 diesel Duoprop sterndrive propulsion system and their cruising speed of 28 knots to get to the fishing grounds faster – which leaves their guests more time to land big catches. The design of the Volvo Penta diesel engines and Duoprop propulsion system helps the Sorceress accelerate faster and make the boat quieter, as well as highly maneuverable and responsive, all critical features for fishing tours in Alaska’s fjords. The system helps lower operating costs for Puffin Fishing Charters by lowering their fuel consumption by up to 30 percent. With the Volvo Penta system’s higher fuel efficiency, the vessel has a range of 300+ nautical miles. The engines are also environmentally friendly as they are certified to EPA Marine Tier 3 regulations. You can see a video of the boat in action here. “We designed a charter fishing boat for Puffin Charter Tours that provides rugged stability and strength. The fuel efficiency of its D6 Volvo Penta engines and their unbeatable uptime are a perfect match for the day-to-day needs of Puffin Charter Tours,” said Cory Armstrong at ACI Boats. ACI Boats, a partner of Pacific Power Group, designed and built the boat at their Port Townsend, Wash., yard. The Sorceress is fully outfitted for fishing charter charters with fish lockers, bait locker, fish cleaning station and rod holders. Construction of the boat was completed in May and it was delivered to Puffin Marine in early June. The vessel will be serviced by Seward Heavy Industrial power, the Volvo Penta authorized dealer in Seward, Alaska. The local support ensures Puffin Marine that parts and service support are readily available when needed. 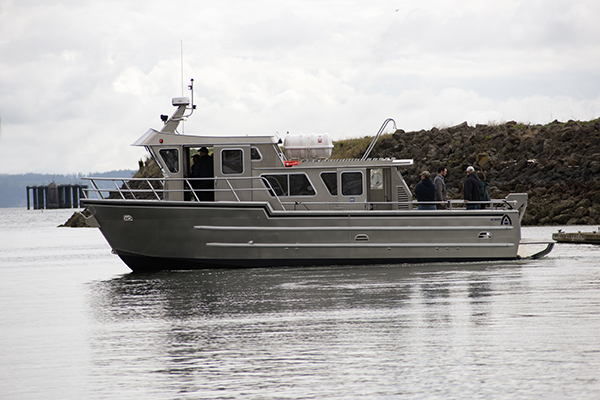 This all aluminum multi-fishery vessel is built and designed by the team at Strongback Metal Boats in Bellingham, WA. 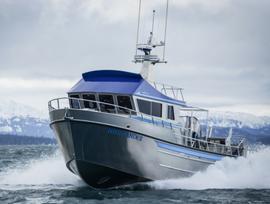 The vessel is powered by the popular Volvo Penta D13 engine, which was selected to meet the ever changing needs of Alaska fishermen. It supplies the vessel with 700 HP and offers the fisheries low fuel consumption, smooth operation and world-class performance to power their success.